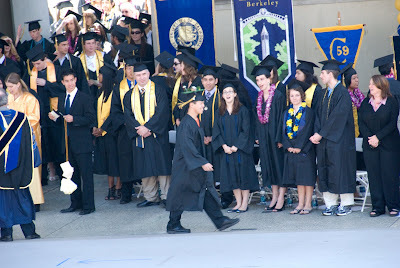 Here's my Class of 2009 Graduation Cap for the University of California Berkeley. It is covered with a small "green world," complete with a solar power plant and a wind turbine. The solar panel works, and actually drives the wind turbine. So while not true generation, it helps to demonstrate renewable energy at least. I was involved in several sustainable groups on campus. I helped pass the Green Initiative Fund (TGIF) legislation on campus, which generates $200,000 annually for green projects at Berkeley. I also taught the Joy of Garbage DeCal course for six semesters. This course explored the impact of our waste on the past, present and future. Finally I was the Waste Reduction Manger (WRM) at my housing cooperative for four semesters. The house contains an arm connected to the Sun. The sun can be raised by a remote control. I used this while walking across the stage to wave to the family. You can see this in the two videos below. 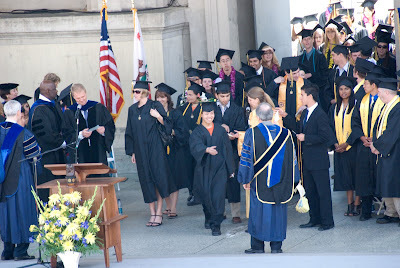 I majored in Product Design through the Interdisciplinary Studies Program at Berkeley and hope to work on green sustainable products in the future. Love the cap Pocky. Congratulations on graduating! Awesome way to stand out from the crowd. I would love to learn how you controlled the sun/arm. What electronics, code and all things of that nature. CONGRATZ ON THE GRADUATION BABE. Mochii wants a cap. go get her a cap. and an umbrella. OH I KNOW! you should create a hat store. with cool hats. A store that people go into and say "OMG THATS SO COOL" but end up not buying anything. I showed this to someone last night, and they thought the tassle should have spun on the fan motor! I'm glad to see four years there really paid off! That's just about the coolest thing I've seen. The sun movement uses a 2 channel remote control from a microzoomer RC car. The gear assembly was simply flipped over and attached to the "arm" to raise and lower the sun. I'm so proud of you. Congratulations! 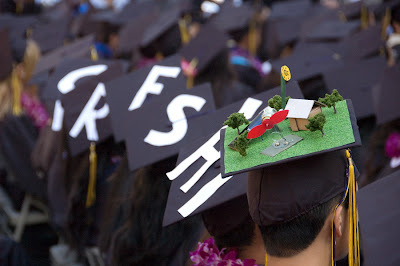 This is very creative, A great idea to celebrate the graduation. What I don't understand is how anyone with access to an air-force would just sit there and watch UFOs fly by. Surely anyone with a modicum of curiosity would scramble up there for a better look. To me it looked like balloons being carried along by the wind. Congratulations to these bright graduates. They might have some barbeques afterward using some new generation solar grill...this can be really fun. Because of this, the future will be better so much if students who has the same thinking as yours will be unfold too. Congratulations and hope to see more of your work.